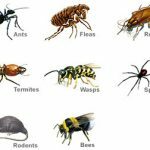 Pest Control: Roaches, Ants, Spiders, Water bugs, Fleas, Mice/Rats, Bees/Hive Removal, Wasps, Bed Bugs, Silverfish, Flies, and other common pests. (IPM) Integrated Pest Management: Sealing/Patching of holes, weather stripping all entry points, trimming back trees/shrubbery, etc. Termite Control: Whole Structure Fumigation, Local Treatment, Subterranean Treatment, Wood Repair (Due to Termite Damage) and Termite Inspections. Animal Trapping/Removal: Skunks, Raccoons, Gophers, Squirrels, Birds and other common small animals / Dead Animal removal.